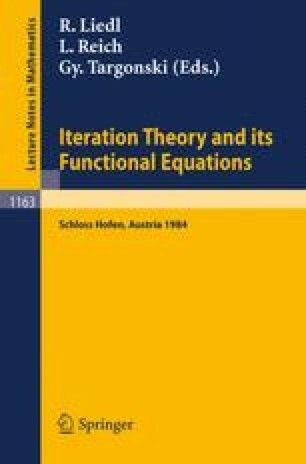 A functional equation φ(ω(x))=ω′(x)φ(x) for φ(x) is derived for the problem of finding φ so that for a given orientation-preserving everywhere-differentiable homeomorphism ω(x) of [0,1] with ω' ≠ 0, there exists a solution F(x,t) to Ft(x,t)=φ(F(x,t)) so that F(x,0)=x, F(x,1)=ω(x). A solution to the functional equation is given for the case where ω has a finite number of fixed points ai with ω'(ai) ≠ 1. The analogous equation in n-dimensional space is given.